Top 5 ways to learn english language Today we are discuss Top 5 ways to learn English language. Many student hate English language because they basic knowledge weak. if they improve small word and basic knowledge of English, after some time they love English. Everyone have different learning speed, but as you navigate toward your future goals, we are here to help guide you to success as quickly as possible. 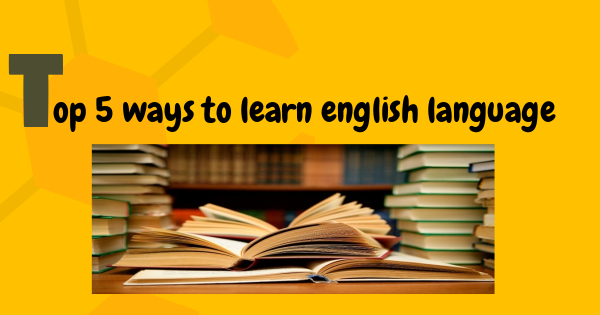 so here is top 5 ways to learn english. Read children's book is very crucial, because children's book easy and story book. Comic books also important because this books graphically represent. human brain easy learn when see image. comic books in English helps to put words into context and make learning fun especially when you’re just starting out. If you’re a fan of nonfiction, you might want to read a biography of a famous person, like a movie star or your favorite sports personality. If you hate to read English and English grammar books. then you watch english movies with subtitle. This method is very effective because watch movie is interesting and everyone love movies. Movies have the power to relieve the tension and to make us feel good. The regular jobs of ours drain us a little and that is why we start looking for an escape. Well, nothing is better than watching movies if you really want to make yourself relaxed. Moreover, movies open up our mind to think more creatively. Here some points are given which will help you to learn English from English movies. If you want to sharpen your English listening skills. then best method listen songs, radio and English news. if you don't interested to listen radio and news, don't wary you listen you want. Listening to conversations in English is one of the most effective ways to build your vocabulary and speaking skills. There are a wide range of free podcasts and available applications online that can help you learn English quickly. At present available many application for android and ios user. If you use smart phone, you check so important application from play store and ios store. Another method to take advantage of online media is YouTube. Watching videos on YouTube is fun. There are millions of videos available on YouTube. The list which I have prepared contains my favourite Youtube English learning channels. Youtube videos help in learning English Conversation. So, without wasting any second, let's go through the list below. Last and final tips to learn English is speak English with your friend and family member. if your friend and family member can't speak English then become new friend how speak English very well. NOTE: THINK IN ENGLISH - IMPROVE ENGLISH NATURALLY: Whenever you think about anything, do you need to push yourself to do that? Do you feel like shorting of words? No. Why? Because you are doing that in your native language and you obviously master your native language that is the reason you do not require to find the words while speaking. Conclusion: if you have any query comment in blew comment box and if you have any suggest then also comment in comment box or contact us page. thanks for read this article have a good day.